Matching up with the exact requirements of customers, we are involved in presenting wide array of Crystal Ball. A beautiful and perhaps an all time favorite shrimp with proper red and white stripes. Their striking color easily grabs attention. We can supply this in large quantities. Crystal are splendid symbols of the earth element. Crystal can create and store energy. These faceted crystal drops create rainbows when hung by the window. They catch the sunlight and break the light into rainbow which brings precious Yang energy into the home. 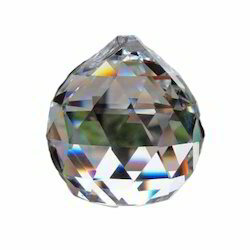 Catering to the requirements of our clients, we are involved in offering Crystal Water Ball. Being a foremost organization in the industry, we are actively engaged in offering the best quality range of Sunstone Ball. We are providing the crystal glass balls with hole in any coloures.